Apple engineers have been hard at work in the eight months since Apple CEO Steve Jobs first previewed Lion at last October’s Back to the Mac event, and the next version of Mac OS X got a thirty-minute spotlight—led by Apple executives Phil Schiller and Craig Federighi—at Monday’s Worldwide Developers Conference keynote. That preview focused primarily on expanding on features previously showcased (during October’s event and on Apple’s Website), but Schiller also revealed three brand-new bits of information: the new OS’s ship July date, $30 price tag, and Mac App Store exclusivity. Schiller and Federighi had time to talk about and demonstrate ten of Lion’s over 250 new features at Monday’s keynote: multitouch gestures, fullscreen applications, Mission Control, the Mac App Store, Launchpad, Resume, Auto Save, Versions, AirDrop, and improvements to Mail. The two tag-teamed the presentation, with Schiller, Apple’s senior vice president of worldwide product marketing, giving general overviews while Federighi, vice president of OS X software, provided hands-on demonstrations. Federighi demonstrated these new gestures in several of Apple’s default applications. In Safari, for example, he used a two-finger swipe to go forward and backward in the browser; he also showed how to zoom fluidly by using a reverse-pinch gesture, and how to swipe full-screen apps on and off the screen. Mac OS Lion will also offer developers an easy way to build full-screen support into their applications. You can send an application into fullscreen mode by clicking the fullscreen icon in the top right corner of the window; once there, you can return to the desktop (and your other open windows) by using a swipe gesture or by returning to windowed mode. Apple has integrated fullscreen mode into many applications in Lion (15, according to one slide). Ones specifically mentioned in the keynote include Safari, Mail, iCal, Preview, Photo Booth, iPhoto, iMovie, iTunes, Aperture, Keynote, Pages, Numbers, and XCode. 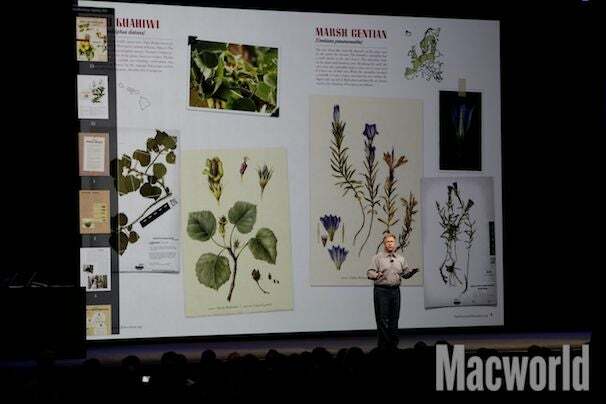 As a demonstration, Federighi pulled up fullscreen versions of iPhoto, Safari, and Photo Booth. During the Photo Booth demonstration, the audience got a sneak peek at a few of the new effects coming to the program along with Lion, including the Dizzy filter, which will animate a flock of birds circling over your head, cartoon-style. Federighi also pinted out that this demo took advantage of new face-detection technology that follows your face around the screen. Devised to enhance and replace Spaces, Exposé, and Dashboard, Mission Control gives you an overview of everything on your system: windows, applications, and Spaces workspaces. Activated by a multitouch swipe, Mission Control displays your current workspace and all its windows, grouped by application. You can get a Quick Look preview of an individual window by hovering over it and tapping Spacebar, or isolate an application’s windows with a two finger swipe. Spaces workspaces, previously managed within System Preferences, have taken root along the top of the Mission Control screen, and Dashboard has been converted from a hover overlay into its own workspace (positioned at the left end of the workspaces "bar"). You can drag applications and windows from desktop to desktop, and even add or delete desktops directly from Mission Control. Click on a desktop, and you’ll be brought there; you can also switch using a multitouch gesture. In addition to it being the sole way to download Lion upon the OS’s July release, the Mac App Store—first introduced in Mac OS X 10.6.6—will feature prominently in Lion. In talking about the store, Schiller first spoke about the success of the store since its launch in January before moving on to some of the new store-related features coming in Lion. For example, developers will be able to add iOS-like in-app purchases, sandboxing (for heightened security), and push notifications to their apps. The Lion version of the store will also offer faster software updates, thanks to switching to “delta” updates, which download only changes to code rather than forcing customers to re-download the entire application every time it's updated. A direct homage to iOS’s Home screen, Launchpad offers simple application management for those who wish to avoid digging around in the Finder. You view LaunchPad with a four-finger pinch gesture or by clicking its app in the Dock, and it shows all of your application icons laid out in an iOS-like grid. You can drag applications to organize them, create folders, and add additional screens. When you purchase apps from the Mac App Store, they're automatically added to LaunchPad—you can track the download status of an app via the progress bar its icon within Launchpad. These three Lion features are designed to work in concert with each other to keep your productivity and uptime high. Resume lets applications freeze in place upon quit; when you re-launch an application, it will remember where everything—open documents, palettes, windows, and the like—was the last time you quit and restore everything precisely. The feature will also work systemwide, allowing you to restart your Mac, or log out, and bring it exactly back to that state the next time you log in. Versions works with the Auto Save feature to let you restore documents, or portions of documents, from earlier saves. You can enter a Time Machine-like interface to browse all saved versions of the current document; you can then cut and copy between an older version and the curent version, or select an older version to restore in full. When you share a document with someone else, however, your revisions stay with you—there's no need to worry about your friends being able to browse the thirty previous revisions on their own computer. OS X’s e-mail client has gotten a full makeover in Lion, adding a new three-column view, a conversation view, message previews in the message list, search suggestions, color-coded threads, and multiple flags. Conversations allow you to see every e-mail from a thread—sent and received—grouped nicely; within the e-mails themselves, quoted text has been hidden, to allow for more coherent reading. If you start typing words into Mail’s search box, search suggestions will prompt you with ideas for what you were typing—names, subject headers, dates—which you can accept by hitting the return key on your keyboard. You can stack up multiple suggestions to create multi-tiered searches, like searching for one author and a specific subject line, for example. Also new is the Favorites bar, which lets you place frequently used mailboxes above the message list so you can hide the mailbox area. Though there was no time to demonstrate them all during Schiller and Federighi’s relatively short session, Lion promises a slew of other new and updated features waiting to be played with, including easier migration from Windows machines; an upgraded version of FileVault; FaceTime; system-wide dictionary lookup; a Finder reorganization and new All My Files section, organized by type; one-click archiving in Mail; Quick Look Spotlight results; iChat service plug-ins; window resizing from any edge; local snapshots in Time Machine; Exchange 2010 support; a character chooser; and more. Developers will have plenty of new Lion tricks to tinker with, as well: Lion will feature over 3000 new APIs, including versioning, push notifications, gesture tracking, fullscreen mode, and more. Though not mentioned during the keynote itself, Apple updated its Website on Monday to reveal more details about Lion Server. Like Lion itself, Lion Server will be available exclusively on the Mac App Store, but will be priced at $50. The Server version will include the Server app for setup and administration; other features include the Profile Manager, for remote management of computers and iOS devices, File Sharing for iPad, push notifications, Wiki Server 3, iCal Server 3, Mail Server 3, and Xsan Admin, for configuring Xsan volumes. Updated at 1:00 p.m. PST to add details about Lion features. Updated at 2:00 p.m. PST to add information about Lion Server. Updated at 2:25 p.m. PST to add clarifications. Updated at 3:35 p.m. PST with many additional details.